Sebastian Larsson had an eventful night as the former Arsenal, Birmingham and Sunderland man was sent off moments after scoring a dramatic equaliser for AIK. 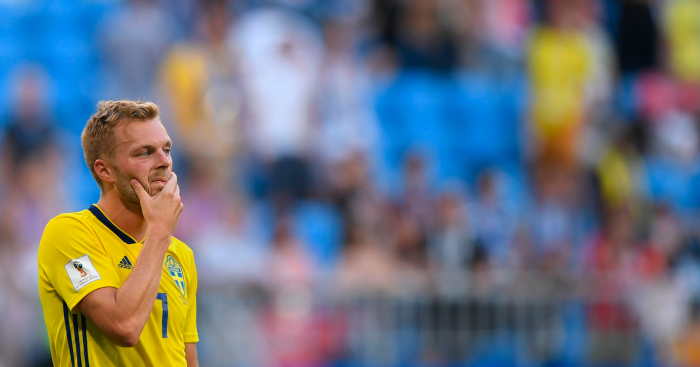 The Swedish outfit, battling to finish top of the Allsvenskan, were losing 1-0 to reigning champions Malmo when they were awarded a free-kick in the 96th minute. Larsson stepped up and duly dispatched the set piece into the top corner with a brilliant free-kick which clipped the post on its way into the back of the net. The 33-year-old celebrated wildly in front of the visitors’ bench, prompting a touchline scuffle, which ultimately saw him receive a second yellow card. AIK are now four points clear of Norrkoping with three games of the season remaining, although they may now be without Larsson for their trip to Ostersunds, in which they could potentially wrap up the title.